Just 48 hours a Canadian leak lends hope to a pentaband Lumia 920 surfacing in the wild, comes word out of WPCentral’s user forums that an unlocked developer edition of the 920 is running on T-Mobile’s HSPA+ network. 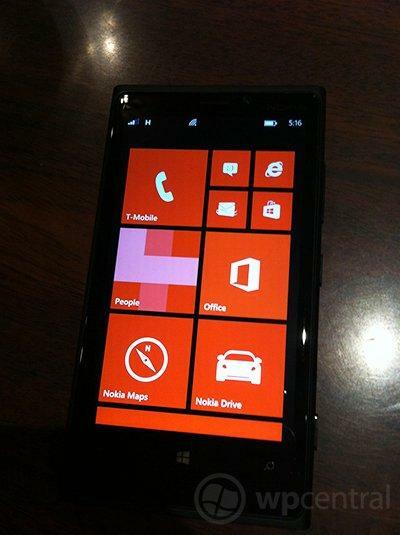 After purchasing the developer unlocked device online, forum user KoukiFC3S managed to get the Lumia 920 functioning on T-Mobile’s US network (reportedly using the 1700MHz band) and even posted some screenshots of speed tests are verifiable proof. The tests certainly use T-Mobile’s HSPA+ network, but the speeds themselves don’t really come close to the HSPA+ 42Mbps speeds some of us are used to with T-Mobile branded devices. 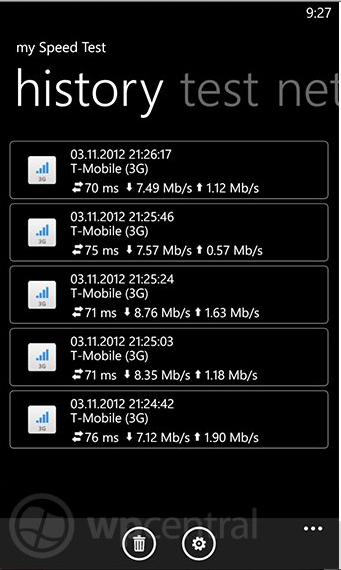 Even with relatively slower speeds on T-Mobile’s network, the promise of using an unlocked Lumia 920 on T-Mobile is one we can’t ignore. If the Lumia 810 or Windows Phone 8X won’t satisfy the most ardent of Windows Phone 8 supporters, grab yourself an unlocked Lumia 920 (wherever you can find one) and enjoy. I’m a tmobile tech rep and can confirm the Lumia 920 does work on our network (3G) yesterday I gave the APN settings to a tmobile dealer and the customer was able to get on the Internet and make calls with no problem. Be careful what information you give. Yes you’ll get data, but not always 3G/HSDPA. From what I’ve read, the AT&T 920 does NOT have the 1700MHz band & therefore will fall back on 2G/Edge unless you are in an area where T-Mobile has already started their upgrades for LTE in which they started using the frequencies they got from the AT&T merger failure. Users using 920 on WIND in Canada. They don’t have EDGE or 1900 spectrum. Just 1700 HSPA. So it absolutely works. As, I said, depends on the sku. The article is about the Developer ones & I heard there’s a Canadian operator that has pentaband as well. Not all 920 are though, which Gallagher25 just said the 920, not specifying which sku. That’s exactly what he said in his first post. Thanks for repeating it. I was offering more substance to what he said, what were are you doing? Thanks for typing a line of text for no reason. “What were are you doing?” What? And commenting on how you wasted space repeating something that was already said. I’ll add “substance” then as well. Yeah, but that’s the user manual. See page 5/78 and onward in the “SAR r2” document. to fix MMS APN & picture size on Touch Pro 2 custom ROMs. No matter how many downvotes you do won’t change the truth. Qualcomm doesn’t have pentaband chipsets. These pentaband 920’s are custom & must use extra chips. That costs more money. Yes, Nokia had pentaband Symbian device, but they ran on Broadcom SoCs, which does have pentaband. Also, the name is Keith, not Kevin, lol. So does that mean the pentaband N4 which uses the Qualcomm S4 pro chip has another chip to enable pentaband? If so, how does it affect battery life? No, Nokia used Broadcom SoCs in their devices before switching to WP. Broadcom has had pentaband SOCs for yrs now. You may be a developer. That’s great. But your statement above still isn’t factual. Sorry, both Samsung aren’t Pentaband & have Exynos SoCs, not Qualcomm. The Atrix HD is Qualcomm, but only quadband. I do know what I’m talking about. I’m a T-Mobile customer & follow hardware all the time. Please check your facts before speaking. As I did say though, my knowledge is only as good as my sources. If they turn out wrong, then I’ll admit my mistake. As for the AT&T 920 having 1700 according to the FCC. The manual clearly says it doesn’t, which means AT&T will probably have it blocked/turned off in the firmware to prevent compatibility. At least I wouldn’t be surprised. I am getting downvotes because people don’t want their hopes being broken & want to believe everything they read without investigating for themselves & than wonder why they buy something & it doesn’t work as intended. Wtf are you talking about this phone is unlocked, genius, just because it’s not a t-mobile phone doesn’t mean it’s going to fall back on edge, didn’t you read the article tissue specifically said, “(reportedly using the 1700 MHZ band)” by no means does it say it’s using the stupid 1900 mhz band which is mostly for pcs right now, dude read the article and stay up to date. Maybe you should read my comments Not all Lumia 920’s support it. This article is about the 920’s given to developers at Build. I have read that the Canadian Rogers might also support 1700, but everything I’ve read on the AT&T one does NOT. Try to read in the future. There are different versions of the 920 just like there are different versions of the 820, aka the T-Mobile 810 is a 820 with 1700MHz support. NOTE: Everything I’ve said is based on information i have read. There is the chance that said information is wrong. It could even be possible that the AT&T one does support 1700 at the hardware level, but AT&T has it disabled in the firmware somewhere. There is no telling. My main point is to be careful. It may or may not work, but saying all work is misleading when you don’t know 100% yet. No 1700/2100 listed for 3G, that’s LTE. It is possible that maybe it’s using the LTE radio for 3G & maybe that’s why the speed is so low. There is the “At&t Note” that XDA Developer member tomin.fhl edited the Modem firmware & got it to work on T-Mobile’s 3G using the LTE Radio. If you check the creator post, you’ll see he has less bars & only gets 9Mbs/2Mbs. There is a bounty started for the ATT Galaxy S3 i747 as well. Canadian and AT&T models are exactly the same. GSMArena is wrong. FCC is right. North American Lumia 920 and 820 support WCDMA 850/900/1700/1900/2100. Pentaband and works perfectly on T-Mobile’s AWS HSPA+ network and PCS HSPA+ network. Additionally, North American Lumia 920 has LTE band classes 1, 2, 4, 5. That means it’ll work on T-Mobile’s AWS LTE network, too. The the FCC filings show that the Lumia 920 does support AWS HSPA+ and LTE. I’m not sure what you’re not getting. Go take a look at the Snapdragon S4 Plus MSM8960 and you’ll see that the chi supports pentaband WCDMA and LTE and is quadband for EDGE bands. Yes, Nokia may lock the firmware, but that can easily be bypassed with using international firmware. As a developer you should have some knowledge of this. Yes, I saw that. Still doesn’t change you guys are making a big thing out of a warning so people don’t waste their money. Here’s the truth, no one knows 100% what device support what networks till you have it in hand & test it yourself. Not everything on the internet is true. I scrutinise everything before I spend my hard earned money on something & don’t take peoples’ word for it. The original poster thanks me for making my statement. Why is it so hard for you to accept it for what it was & trying to prove something? Please provide your source for “Go take a look at the Snapdragon S4 Plus MSM8960 and you’ll see that the chi supports pentaband WCDMA and LTE and is quadband for EDGE bands.”, I don’t see this listed anywhere. This goes to anyone, please provide sources of where you got your information as I am. And if this true, than the 8X/8S/Ativ S should also be pentaband. So, why is it only the Lumias being found as pentaband. Someone said 820 as well, while I haven’t heard that myself yet & not going to do their work to prove them right/wrong. As for using other firmware to unlock things, yes, it is possible. But, it’s not always easy. WP8 will use hardware security chips that requires signature to allow flashing of firmware. This could be very complicated to break if even possible. Very true Keith I was going by the info the dealer told me thanks. Good new for WP fans, nice! I just want to buy one, unlock it, and put android on it. I’m sure there will be a port for this soon. I like Android also, but that’s not the point of this phone. Windows phone is really starting to look better than ever this year, I hope they do well. So what? The 920 isn’t available at T-Mobile. End of story. Nokia was stupid to do an exclusive deal with AT&T. I have been using a Microsoft Equipment developer’s Windows Phone 7 (an unlocked AT&T LG GW910 (LG Panther in Europe) that never made it to the U.S. market). It has decent specs and I have been using it via AT&T, WiFi, and 3G here in San Francisco. I can post pics of the phone, if requested. Also see YouTube for 2010 videos of the phone. “There are mostly three cell phone operating systems, then there’s the rest of them. There’s Android-Google based phones (and other devices); Apple (the iPhone with various iOS iterations); and BlackBerry (who is sadly fading fast). There are other “ROMs” and manufacturers who have faded into insignificance, or are trying to remain relevant in the smartphone market; Microsoft’s Windows Phone is in this category. I have been using a Windows Phone 7 smartphone so I could accurately report to readers what is what. As you know, I used to use $500 feature phones (back when there was no such thing as smartphones) PALM, WinCE, Windows Mobile, Android, and the iPhone. Comparing all these phones, I will be the first to admit the Windows Phone devices physically have excellent fit, finish, specs, and quality. The feel is as one expects and demands from an electronic device that sells for $500 retail. Alas, hardware is NOT the problem with a Windows Phone, it is the software, specifically, the WP 7 (or 8) operating system (aka “ROM”), the new interface (although the phone is VERY easy to use), and the lack of apps and programs. I can’t get into all this in a Holiday 2012 shopping guide, suffice it to say that THIS holiday season is NOT the time to “enlist in Microsoft’s guinea pig brigade,” and this is precisely what you will be doing if you buy a Windows Phone smartphone or computer with Windows 8 (installed or promised).